The Breakdown: How Does Incumbency Affect Elections? If incumbents are running scared, what does that mean for the phenomenon of the incumbency effect? With mid-term elections fast approaching in November, the harsh political climate has left many incumbents vulnerable. This has caused a string of retirements in contentious states (Chris Dodd, Evan Bayh, Patrick Kennedy) and a number of hotly contested primary races for seats once considered safe (Harry Reid, John McCain). If incumbents are running scared, what does that mean for the phenomena the incumbency effect? How does holding office really affect reelection? Is incumbency the most important factor–or are other variables more determinative? 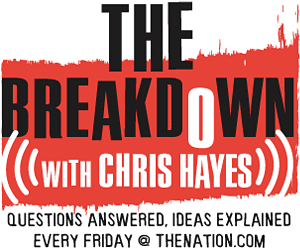 To answer these questions, this week’s The Breakdown with Christopher Hayes invited Professor Walter Stone from the University of California-Davis to discuss the intricacies of the incumbency effect. This week’s question comes from ExplainThis.org. Editor’s Note: The Breakdown is now being produced in partnership with ExplainThis.org, a new website devoted to explanatory journalism. Visitors to the site can post questions, which are sorted and ranked, and then answered by journalists. ExplainThis.org has set up a special page for The Breakdown, so you can now ask Christopher Hayes your questions via e-mail, twitter or online–at ExplainThis.org/thebreakdown.